I watched the first season twice already, and I absolutely love it. If you like school/slice of life/ romance/ comedy, this is certainly a series for you. Season 1 was amazing and I hope that Season 2 will be also. Remember that this is Season 2 that is ongoing, and if you haven't seen Season 1 go watch that first. This is hands down one of my instantly all time favorite anime. The story and the characters are so easy to relate to its unbelievable funny and beautifully animated. I've been waiting for this new season since early 2013 and its finally here. I'm so glad i'm able to watch this THANK YOU CRUNCHYROLL!!! First season of this show was amazing, real glad they added season 2 here on crunchyroll. If yall didnt watch the first season please watch it before you watch this. You can find season 1 on hulu or elsewhere if u google it. Characters here are awsome, great story line, art is wonderful. Overall glad CR added this anime. Season 2 START! I have been a big fan of this series when it first came out and this was a great fix of Chunibyo after such a long wait. A good amount of fan service from Rikka calling her antenna of hair her most attractive feature to a large Chunibyo battle at the end. No plot to speak of as of yet as the first episode was just a reintroduction into this world so expect the overarching plot to be introduced next episode. Following the release of Kyoukai no Kanata last season, KyoAni strikes again with the second season of one of my favorite animes to date. The animation may seem the same, but I noticed that it's definitely more fluid especially with the delusional scenes. Production value must be through the roof, but I say it's worth it for the "action" scenes, even if they are only a small part of the series' allure. Leave it to KyoAni to make adaptations of the cutest rom-com plots of the anime industry. Definitely one to follow (again) this season. I absolutely adored the first season and so far this season is stepping up to the challenge. This season is just as good as the first season or slightly short of it.... at least for now. 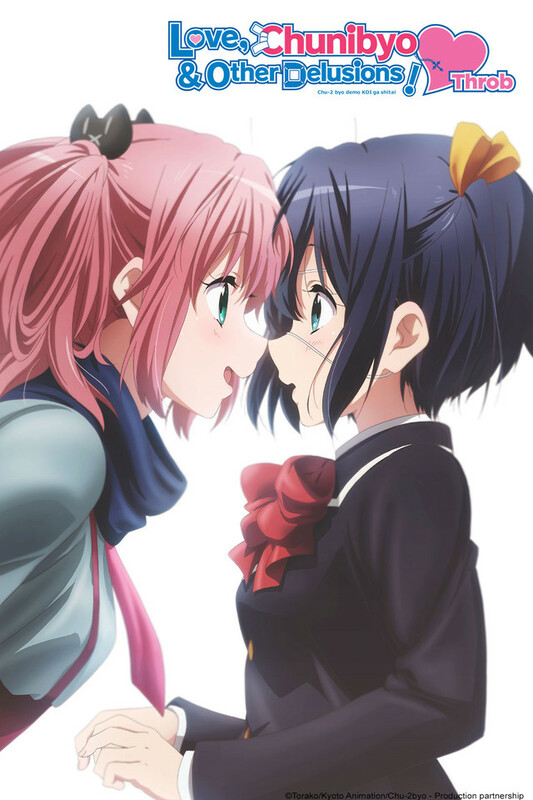 I really hope that Yuta and Rikka's relationship progresses faster and reaches a kiss before the last episode. so far it's progressing pretty well with the hand-holding in the second episode and the nose touching the third. WHY is this getting 5 stars?! It's utterly pointless. The entire first episode basically takes place in a classroom, and it seemed like the entire reason it was made was just for yet another school girls in short skirts thing, the extent of characterization boils down to the number of different hair/eye color/skirt length combos; and consisted of 25 minutes of meaningless cutesy bs in a classroom. Boring as hell.. no plot detected other than meaningless school girl squealing, one of the dolls transforms something out of her eye after too much squealing… and then dumb cgi and lame ‘battle’ mode time! Yawn. Not much of anything important happened… no story, no point, just a waste of time! DON’T FORGET THE CHERRY BLOSSOMS! An AMAZING series. If you had not watched the first part please do. A very interesting series that takes a high school romance and adds a nice set of embarrassing obstacles in the way. It's funny, it's cute, gets sad, but then relieving, it's utterly fantastic. Now, I'm not much of a romantic comedy person, all aspects of this have really touched me. Filled with heartwarming moments and hilarious antics, this is a much watch. I do hope there is more for the indefinite future.